“You’re All The World To Me” was written for the 1951 MGM musical Royal Wedding, starring Fred Astaire. Astaire performed this song in one of the most famous shots in all of musical film: the dancing on the ceiling number. Everywhere the angels play you are. You’re New York on a silvery day. You’re Loch Lomond when autumn is the painter. And no wonder: you’re all the world to me. You’re Sun Valley right after a snow. The blue calm of a tropical sea. “You’re All the World To Me” was recorded in July 1993 and was released that year on Steppin’ Out. 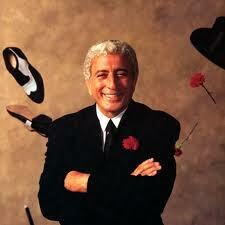 It was arranged by Tony Bennett and Ralph Sharon. “You’re All the World To Me” was recorded and televised live on April 12, 1994 on MTV. The MTV Unplugged album was released in June of that year. The songs from the televised concert were arranged by Tony Bennett and the Ralph Sharon Trio.